'Lavender Blue' was a young and inspiring, pale coated blue Persian kitten, raised during the time of the second 'bloom' of popularity for the Blue Persian as a variety. Many of the first Blues came out of breedings between other colours, for instance, from a White bred to a Black. In the case, the dam of 'Lavender Blue' was 'Peggotty' (born in August, 1893), one of Miss Kirkpatrick's earliest blue females, bred by Mrs. Foote. The dam of 'Peggotty' was Mrs. Foote's 'Bright Eyes' who was registered as a Brown Tabby. Miss Kirkpatrick had started her foray into Persians with the purchase of a Black female named 'Dinah' from Mrs. Maile, who was exhibited as a kitten at the Crystal Palace in October of 1892. In 1893, she acquired the Blue female 'Peggotty' from Mrs. Foote, and although the dam of 'Peggotty' was a Brown Tabby, her sire was a blue, 'Don Juan II', owned by Mrs. H.B. Thompson. 'Don Juan II' came from a distinguished line of Blues descended from the original 'Blue Ruin'. In 1894, the blue male 'Wooloomooloo' made a sensational debut at the Crufts Show. His sire was 'Friske' down from 'Jumbo' and 'Tomascine',and it is interesting to note that 'Don Juan II' was descended from a double on 'Blue Ruin II' who was himself descended from a combination doubling on the same 'Jumbo' and 'Tomascine'. 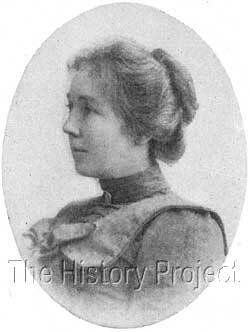 In her chapter on Blues in The Book of The Cat (1903) Miss Simpson first heaps high praise on 'Wooloomooloo', then briefs us on only two other early Blue males before speaking in more detail about the desirable qualities looked for in Blues. The other two males, were Mrs. H.B.Thompson's 'Don Juan' and Mrs. Singleton's 'Moko'.3 These three could be considered to be among the 'second tier' of famous Blues, the first tier including the very early foundation blue stud males, such as 'Ch. Bundle', 'Ch. Glaucus', 'Blue Goblin', 'Jumbo', 'Thunder & Lightning', and 'Turco' who were the among the founding pillars of the Blue Persian variety. Miss Kirkpatrick, chose to breed 'Peggotty' to 'Ch. Wooloomooloo' in early 1897 to produce her blue queen 'Blue Phyllis', and then later in 1899, to her own 'Don Juan II', to produce 'Lavender Blue',- keeping very much within the framework of the somewhat line-bred strains which she knew best. The esteem in which the young Miss Kirkpatrick was held by her peers can be more clearly gauged by a report written by Frances Simpson, on the establishment of the Blue Persian Cat Society, which was formed 24th April, 1901. 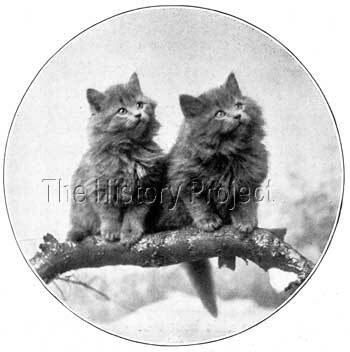 Miss Simpson also chose to feature at least four photos of kittens or cats bred by Miss Kirkpatrick in The Book of The Cat. The first is a photo by E.Landor, of pair of Blue kittens sitting in and alongside a flower basket in the chapter on 'Exhibiting'; the second, (also by Landor), is a photo of a Black Persian kitten (aka 'Sambo') in the chapter on 'Black Persians'; the third, being the image shown left, (again by Landor), shows two lovely Blue Persian kittens perched upon a branch, and is featured in the chapter on 'Blue Persians' ,exactly opposite the segment on the founding of the Blue Persian Cat Society. 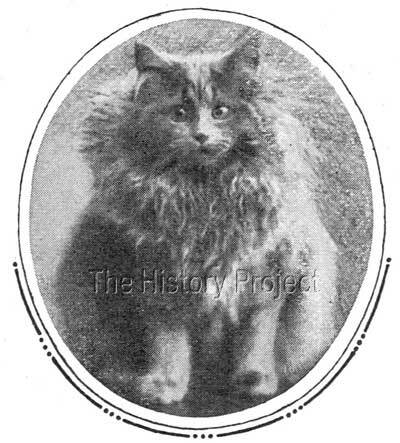 There are no surviving records of any progeny from 'Lavender Blue', but the kitten below, which appeared in a photographic postcard by E.Landor entitled 'the Rivals' and then also as an individual postcard with the caption 'Topsy' is likely to have either been the progeny of 'Lavender Blue' or her dam-sibling 'Blue Phyllis'. 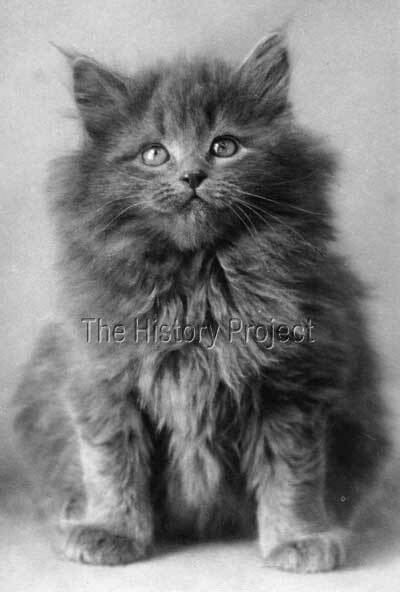 'Lavender Blue' represented the culmination of Miss Kirkpatrick's blue Persian breeding program up to the year 1899, a program which obviously continued unabated for Frances Simpson to use photographs of her kittens which were still current, in 1903. With our brief glimpse into the world of Miss Kirkpatrick, we see a little into the expanding world of the Blue Persian and its successes during what was the second bloom in the expanding waves of popularity of this variety. The establishment of the 'Blue Persian Cat Society' in 1901, then created the impetus for the third bloom of interest in Blues, one which now had the backing of over 187 members and saw other specialist and regional clubs supplied with awards for the Blue Persian classes at their shows. 'Lavender Blue' was an excellent example of what Blue Persian breeders were striving for, a typey Blue Persian cat with a luxurious coat, soft and preferably of a powder blue colour, even throughout. She was simply a reminder of what should and could be attained, with time and effort.